Heavy falls of snow in some parts of the country have disrupted road, rail, bus and air transport. The worst affected areas are parts of Connacht, Ulster and east Leinster. Minister for Transport Noel Dempsey has met representatives from transport organisations and local authorities to coordinate the nationwide response to the bad weather. Mr Dempsey said lessons had been learned following last year's bad weather, but warned that while up to 17,000km of roads would be treated with grit, it would not be possible to treat all roads. Met Éireann has said the ice, sleet, snow and freezing temperatures overnight will continue for some days. Lightning storms last night disrupted transport services this morning: Dublin Airport runways were closed for a time, causing knock-on delays for passengers travelling later. Travellers should check in with their airlines. Driving conditions are difficult in many parts of the country, especially off main routes. AA Roadwatch has advised extreme care on all routes, particularly in counties Sligo, Mayo, Kildare and Waterford City. A number of cars are reported to be stuck on the N17 Galway to Sligo road at Tubbercurry due to a jack-knifed truck. In Co Mayo, snow and ice has been reported on the N5 Dublin road at Swinford and through Claremorris as well as in Westport and Castlebar. Motorists are advised to avoid the N59 Galway to Sligo road at Letterfrack, Co Galway. Gardaí in Waterford City have advised motorists against any unnecessary travel due to snow and icy conditions. Very icy conditions are reported in Cavan and Donegal and along the Ballybay to Carrickmacross road in Co Monaghan. There are dangerous conditions both ways on the M7 Limerick/Dublin Rd from J9 Naas North (Big Ball) through to J14 in Monasterevin. A number of crashes have been reported on roads around Ashbourne in Co Meath on the Ashbourne to Fleenstown Little road and the Ratoath to Baltrasna road. Wexford Harbour Bridge is impassable due to icy conditions. In Dublin, there have been a number of collisions in housing estates in the Blanchardstown and Tallaght areas due to icy conditions. 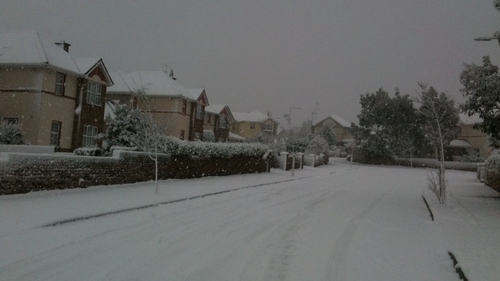 Roads in housing estates in the area are not being gritted overnight so motorists are advised to drive with extra care. North Donegal and west Connacht, along with eastern parts of Leinster, will have further snow showers this weekend and during the early days of next week. Snowfalls measuring up to 10cms in some areas are being forecast over the coming days. Temperatures are expected to dip to -6C in some parts tonight. The Barnesmore Gap in Donegal is particularly dangerous, as is McGrory's Bray on the N15 between Ballybofey and Donegal town. The M9 Waterford/Kilkenny road is closed northbound between Waterford and Mullinavat due to very poor conditions. Gardaí warned that heavy falls of snow have made many roads in the Wicklow Mountains impassable. The National Roads Authority said all national routes were treated last night and that it has enough salt for the coming weather spell. 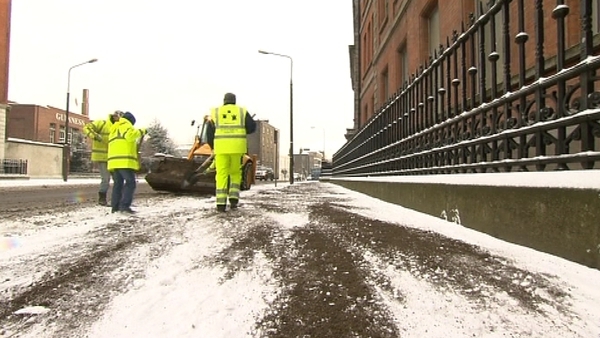 Michael Philips from Dublin City Council said local authorities will be gritting where appropriate and have 30% more salt in stock than this time last year. The Road Safety Authority has urged drivers, cyclists and pedestrians to be extra vigilant. The RSA has advised people to watch out for black ice, use dipped headlights, leave plenty of space to brake and be prepared for breakdowns. A number of Bus Éireann services were experiencing delays and distribution earlier today. Dublin Bus says that there have been a number of diversions on routes as a result of problems with snow. Iarnród Éireann said DART and commuter services resumed following early-morning disruption caused by lightning strikes. Elsewhere, severe weather warnings are in place for almost all of the UK. The UK Met Office has forecast heavy snow, widespread icy roads and freezing temperatures. Some 25cm (10ins) of snow is expected to fall over higher ground, while parts of the Midlands and London will not escape the snowfall. One of the coldest places was Trawscoed in Wales, which saw -10.2C overnight.